Reminiscent of God in a Cup and The Devil's Cup, this is an inside look into the modern business of making coffee. But rather than a general history, Coffee for One focuses on the revolution that made single serve such a popular way to consume coffee worldwide, and the competition and conflict that got us here. This story features A-list names, corporate intrigue, environmental controversy, and much, much more. For the vast majority of the time humans have consumed coffee, the drink has been brewed in pots or other multi-serving tools; that is, until the last two decades, which saw the rise of the single serve coffee machine. Whether it's a Keurig or a Nespresso, today a lot of people get their coffee from little plastic individual serving pods. But why? 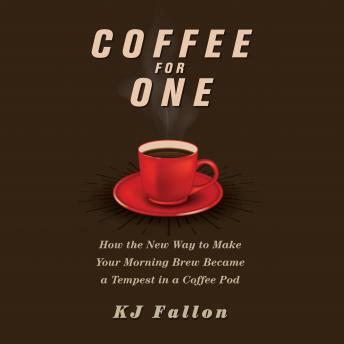 Coffee for One breaks open this story of innovation, profit, and cultural change.